It can be frustrating to hit a perfect drive and then find that your ball has come to rest in a divot. 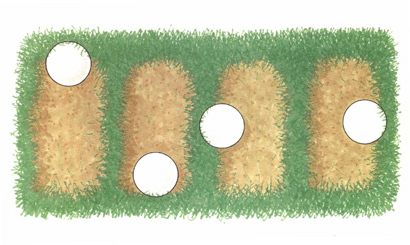 But take heart, not all divot lies are difficult. For instance, when your ball stops at the front of a divot, you have room to get the club in behind the ball. This can often be a blessing in disguise, as it enables a very clean contact - in fact, when you can squeeze the ball between the club and the front of the turf for a split second, you can often put extra height and spin on the shot. In the back of a divot, however, you have problems. In this situation I'll sometimes take a 9-iron or wedge and intentionally hit it thin - skull it - assuming there's no big trouble in front of the green. When you need some loft from this lie, chop down on the ball as if you were coming out of heavy rough. Just take one club more than normal so you don't have to swing too hard. When your ball leans against the inside of the divot, the heel of your club is going to grab and probably shut the clubface down. Usually, I'll aim a little right to compensate. If it's on the outside of the divot, the toe of the club will tend to catch, opening up the face. In this situation, it's wise to aim a bit left.